I always find it exciting to see Tower Bridge open up to let tall ship pass through. Is that silly? Too bad. It is still something I will stop and watch. 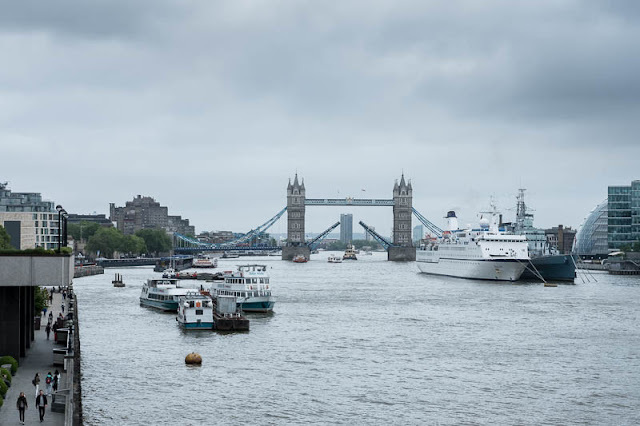 Later in the year Tower Bridge is going to be closed for three months for maintenance, that should create traffic chaos, however there is talk of a ferry to assist with transporting people back and forth. A wee bit of how the river was traversed in the past. I can understand why you always stay to watch the bridge open, I would most likely do the same if I was there, oh, and it such a classic London view. Lucky lass! I never saw that in 21 years! When I stayed at that flat just east of the bridge, I loved watching it open every now and then. I even took the bridge tour that year to learn how it works. I can't imagine it being closed for a period of time. It once opened for a ship Stephen was on. He was super pleased!